Todd Antony is originally from New Zealand, but moved to London 13 years ago, where he is a commercial advertising photographer. He is represented there, as well as the US, France and Australia. Amongst his commercial work, Antony tries to shoot at least one personal project each year to keep himself creatively fresh and engaged. 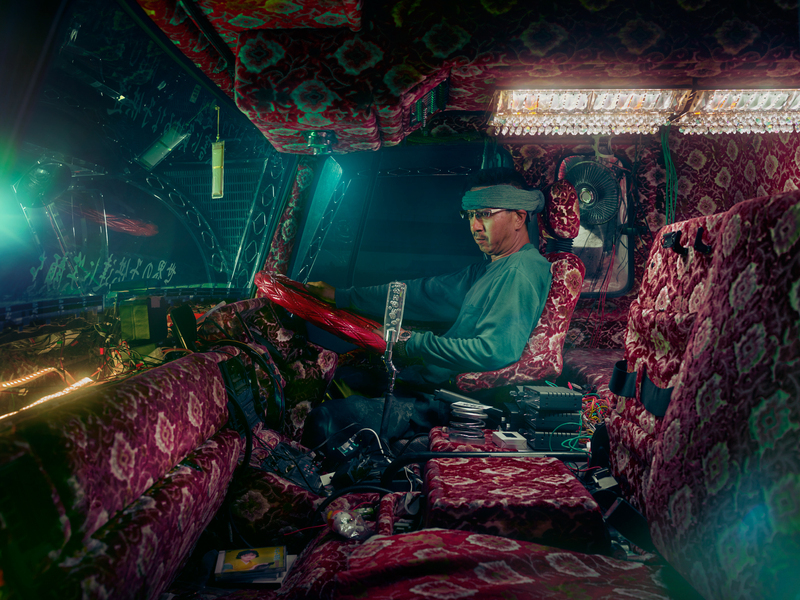 “It’s a fairly symbiotic relationship between my commercial and personal work. The commercial work helps to finance my personal projects, and in return, the personal projects often help to land me commercial jobs,” Antony says. His series Dekotora was awarded by The Fence [2018 NATIONAL]. The FENCE is an annual call for entries to be part of the largest outdoor photography exhibition in North America, with public exhibitions in Brooklyn (NY), Atlanta (GA), Calgary (Canada), Houston (TX), Sarasota (FL), Seattle (WA), Boston (MA), and Denver (CO). Photographers of all levels from around the world, are invited to apply online at fence.photoville.com. The last few years you have focused on various subcultures around the world. Can you tell us more about it? I try and undertake a personal project every year in whatever gap my commercial shooting schedule allows. For the last few years, this personal work has been focussed on shooting various subcultures around the world. This started back in around 2013 when I shot my series ‘Sun City Poms’ and has evolved from there. In some instances it has even crossed over into a couple of my commercial shoots as well. Shortly after shooting the Sun City Poms series, I was commissioned to shoot a campaign called ‘1000 Years of Less Ordinary’ for Finlandia Vodka. We travelled the world shooting ordinary people who lead extraordinary lives in their own unique ways. We shot everything from a gay, drag, Luche Libre wrestler in El Paso, Texas, all the way through to a Man who lives with Grizzly bears up in Lapland. Combined, the ages of everyone in the campaign added up to 1000. I walked away from the shoot feeling more fulfilled than I have in a long time, both creatively and emotionally through the amazing people we got to meet. I think that’s what really solidified my desire and direction to continue shooting little known subcultures for my personal projects. How did you become interested in shooting the series awarded by The Fence? I was researching for a new part of the project and in this instance, different to how I would normally find a new subject, I actually decided to focus geographically, very specifically, on Japan as a location for my starting point for research. As there is a wealth of different subcultures over there. Once I started looking into the various subcultures there, it wasn’t long before I came across Dekotora and I instantly knew that I had to shoot it. From there it was a case of working out how I wanted to portray the drivers and the narrative I wanted to get across. Visually, movies like Nicolas Winding Refn's 'Drive' and 'Only God Forgives' provided a lot of inspiration, as well as Blade Runner. I came across another couple of subculture ideas there during my research as well, so there might be a trip back there in the future to shoot those. But I like to change things up between projects to keep things fresh, both visually and mentally. 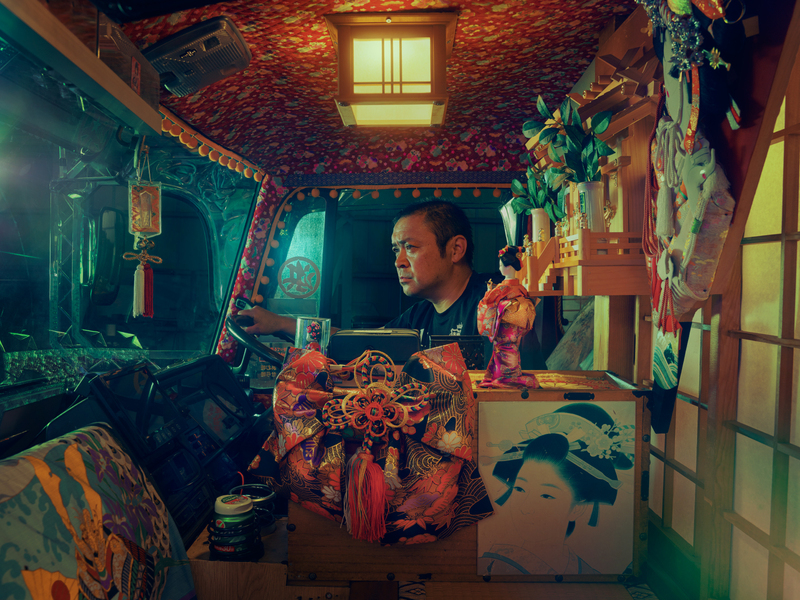 What were the challenges while photographing the Japanese truck drivers? This project had a few challenging aspects that were unique to a lot of my previous shoots. Obviously with shooting in Japan there was the language issue to contend with, as well as the culture over there being very different to work in. There’s a distinctly different way you need to approach things over there. Despite having learnt Japanese at school, I’d basically forgotten 95% of it, which wasn’t overly helpful. Luckily one of my main assistants speaks fluent Japanese, so he was a ‘must have’ in my equipment list so to speak. I also hired a local producer to help me with the pre-production of the shoot, contacting various people to help organise everything in advance. And then she was also with us on the shoot to help further with logistics, language, and most importantly she had already laid the groundwork by meeting a couple of the key figures in the series prior to our arrival in Japan. The heat also played a large and unwelcome part in the shoot. There was a typhoon off the coast of Japan, so the temperature was in the high 30’s and nearly 100% humidity. We spent the best part of a day inside a shed that was housing one of the trucks, and the temperature was well into the 40’s C. It was like shooting in a sauna for 10 hours. The Typhoon did provide one moment of photographic serendipity however. I was framing up an external shot of one of the trucks and the sky was getting darker and darker with clouds by the second. Then at the flick of a switch an absolutely torrential downpour of rain broke out. I’ve never seen it so heavy in my entire life, and it just wouldn't stop. I thought the image was a write-off as we sheltered in the doorway of a mechanics warehouse. 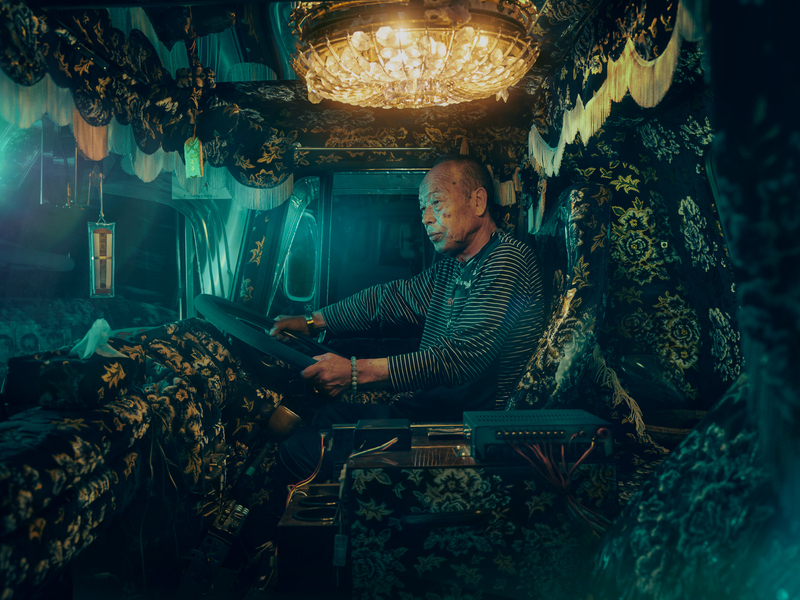 The truck driver was sheltering in the cab of his truck, so we called him on his phone and asked him to light the truck up to see how it would look. It was this amazing beacon in the murky downpour. I put an ND filter on my camera and shot a long exposure of it, so that the falling rain caught in the truck lights created this ethereal like glow. Where did you shoot the images? Mostly in the Honjo Provence, which is a few hours drive outside Tokyo. Junichi Tajima who heads the the ‘Utamaro-Kai’ (the association of Dekotora drivers) lives and has his business there, so it was the natural starting point. He had a couple of drivers come to meet us there, and we drove a bit further on to spend a day with one of the other drivers at one of the few shops and workshops that sell all the equipment to ‘bling up’ the trucks, and where they can install some of the more major bodywork pieces. 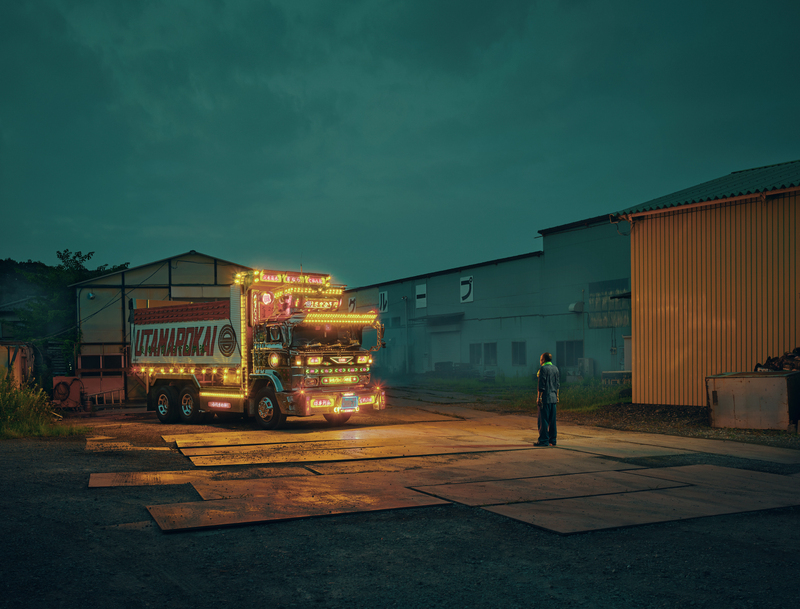 It worked really well for a couple of the external truck images as a lot of the ground around his warehouses are covered in these giant steel plates, so the trucks don’t get stuck in the mud with heavy rain. It created this beautiful reflective surface in one of the images with the truck parked on it. I’ve got a couple of ideas for personal projects in the works currently. I’m going to be going back to Arizona shortly to shoot a companion short film on the retiree cheerleaders the Sun City Poms I mentioned earlier. To work as a companion piece to go with my photo series of them I've already shot. And I’m heading up to Lapland in a few weeks time to shoot a new project that I don’t want to say too much about at this point. There’s only about a 4 week window in February each year that it can be shot, so I don’t want to jinx it!